Imagine you're sitting at home, relaxing and watching television, when a documentary about the extreme poverty of schoolchildren in China comes on screen. Shocked and moved, you decide to do something about it--you donate $50 online to a charity. What's next? In most cases you would be lucky if you even receive a thank you email and periodic newsletters asking for more money; however, my we have a different idea. Yeo Zuo Yi and I founded of RE:action Strategy Group (www.reactionstrategygroup.com) after we discovered the lack of time and resources spent by most charities on donor relationship management. Charitable giving has traditionally been a very one-way deal. But if organizations don't tell donors how they're spening the money or what impact has been made, how do they expect donors to trust them? We found through our research that such a lack of transparency and communication of impact is leading to floundering donor retention rates and jaded donors. RE:action Strategy Group works with non-profits and social entrepreneurs in using social media, events, photos, newsletters, videos and other innovative tools to show donors their impact, in hopes of building greater loyalty and trust. These feedback loops are setting organizations apart, and above, in the growing non-profit sector. RE:action is hoping to create these sector leaders and make our own social impact by drawing more awareness to raise charitable funding. The experience of starting our first business has been a valuable one. As inaugural members of the Compass Fellowship, we are exposed to an intriguing field in which we can use our business expertise for social good. With the guidance of mentors and guest speakers of the program, we took on the stages of business planning, and I'm glad our idea survived the doubts and questions we threw out during the analysis. 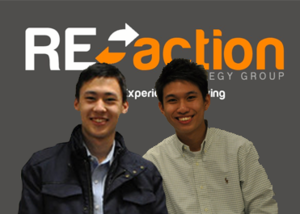 We're excited about the direction of RE:action Strategy Group. Currently we have a growing team of seven members and are working with two clients, with plans to take on three more by the end of the year. Through this business venture, we hope to raise the benchmark for donor relationship management and that this will lead to a deeper social impact across the world.